The destructiveness of a tropical cyclone – called a hurricane in the North Atlantic and Northeast Pacific basins – partly depends on the related characteristics of barometric (or atmospheric) pressure and wind speed. These monster storms consist of a low-pressure center – the “eye” – encircled by howling winds and soaring thunderheads. The more extreme the cyclone’s barometric-pressure gradient, the fiercer its winds. Roughly speaking, you can think of barometric pressure, often measured in millibars, as the weight of overlying air at any given point in the atmosphere. More accurately, it’s proportional with the density of the gas molecules in a unit of air. In an area of low pressure – and more widely spaced air molecules – air tends to rise and become unstable, so low-pressure cells have the potential to be stormy, even violent. In a hurricane, pressure is lowest in the eye and steadily mounts as you proceed outward through the eye wall – that violent front of thunderstorms immediately girdling the eye itself – and then through the rain bands composing the outer spirals. Barometric pressure directly influences wind, because air flows from areas of high to low pressure. The warping of this basic movement by the spin of the planet – the Coriolis force – and by friction causes a cyclone’s winds to rotate counterclockwise around the low-pressure center. The more pronounced the pressure gradient, the swifter the winds. In a hurricane, wind speed increases from the outer rain bands to the eyewall. There’s very little wind in the eye, where sinking air discourages cloudiness; clear skies, or those only lightly veiled by high, wispy clouds, tend to prevail here. Hurricanes arise from stormy cells called tropical disturbances, often triggered by easterly waves. A series of stages ultimately defined by wind speed mark the progression from a tropical disturbance to a full-blown tropical cyclone, a strengthening driven by the evaporation of warm ocean waters and the latent heat released as water vapors condense in rising air. A tropical depression evolves as a discrete low-pressure center and cyclonic winds intensity; the depression becomes a tropical storm if these winds exceed 17.5 meters per second (39 mph). If the winds achieve 33 meters per second (74 mph), the storm officially becomes a tropical cyclone, aka hurricane or typhoon. While the absolute value of barometric pressure is not a determining characteristic, most hurricanes have an eye below 990 millibars. Scientists use both barometric pressure and wind speed to gauge the intensity of a given tropical cyclone. The most intense on record was Typhoon Tip, a mighty whirlwind that roared into Japan in the autumn of 1979. Typhoon Tip’s central pressure registered at 870 millibars on October 12 of that year. Some estimates, however, suggest the November 2013 storm Typhoon Haiyan may have attained even lower barometric pressure: 860 millibars. Typhoon Tip, incidentally, also takes the prize for the largest cyclone yet measured: The immense typhoon boasted gale-force winds extending across a radius of 2,220 kilometers (1,380 miles). A 1996 storm named Tropical Cyclone Olivia, which made landfall in Australia, holds the current record for maximum sustained wind speed: an astonishing 113 meters per second (253 mph). National Oceanic Atmosphere Administration: Hurricane Research Division - Frequency Asked Questions - What is a Tropical Disturbance, a Tropical Depression, or a Tropical Storm? National Oceanic Atmosphere Administration: Hurricane Research Division - Frequency Asked Questions - What is the Most Intense Tropical Cycone on Record? Weather: Did Typhoon Haiyan Have a New Record‐minimum Pressure? 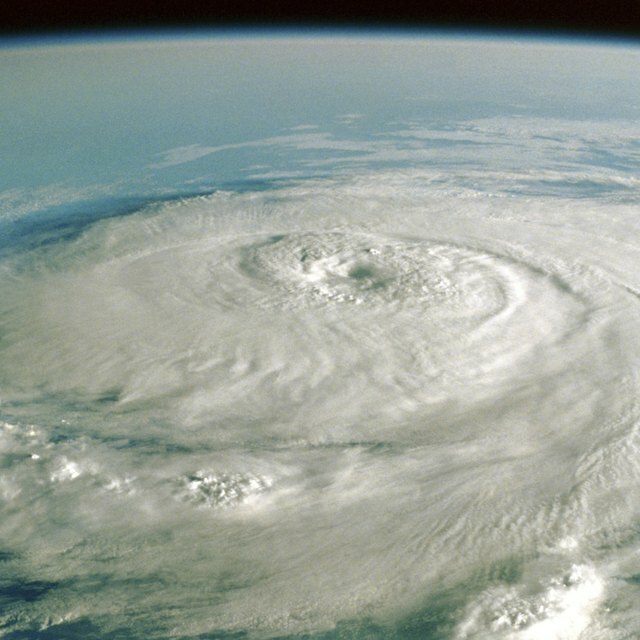 What Is in the Outer Band of a Hurricane? Shaw, Ethan. "Barometric Pressure Vs. Wind Speed of a Hurricane." Sciencing, https://sciencing.com/barometric-pressure-vs-wind-speed-hurricane-19558.html. 14 May 2018.